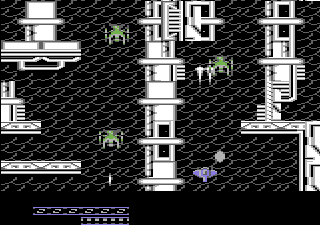 Your mission objective sounds simple enough: shoot your way through different zones and eliminate alien enemy forces on the way - but there are plenty of those. At each zone's end, a boss is waiting, and you have to kill him fast! Only the most elite fighters, the most skillful pilots will prevail! 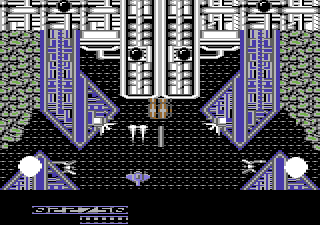 C64 or C128 in C64 mode, 1541/1571 Floppy, 1 or 2 Joysticks. 1541 Ultimate, SD2IEC, uIEC/SD, IEC-ATA, 1581, CMD FD, CMD HD, CMD RAMLink, IDE64, CMD SuperCPU with RAMDisc. Protovision has released this game as freeware! This means that you can download it here at no cost and completely legal. 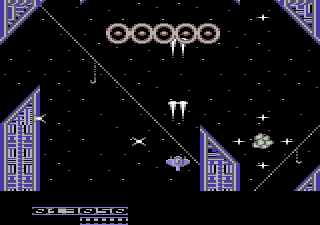 The Zynax trilogy was created using the "Shoot 'em up Construction Kit" (SEUCK). Parts one and two were published exclusively on a GO64! disc. 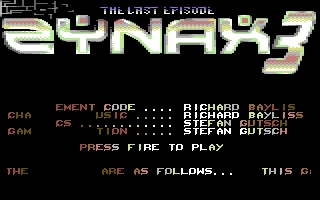 2002, the series ended with the wonderfully catchy soundtrack by Richard Bayliss and a pretty title screen.